Since I started to eat healthier it is a lot easier for me to make one meal for the whole family. Chicken fried rice is a staple in our weekly menu. It's healthy and easy to make. This is my favorite recipe for making chicken fried rice. I use brown rice instead of white. 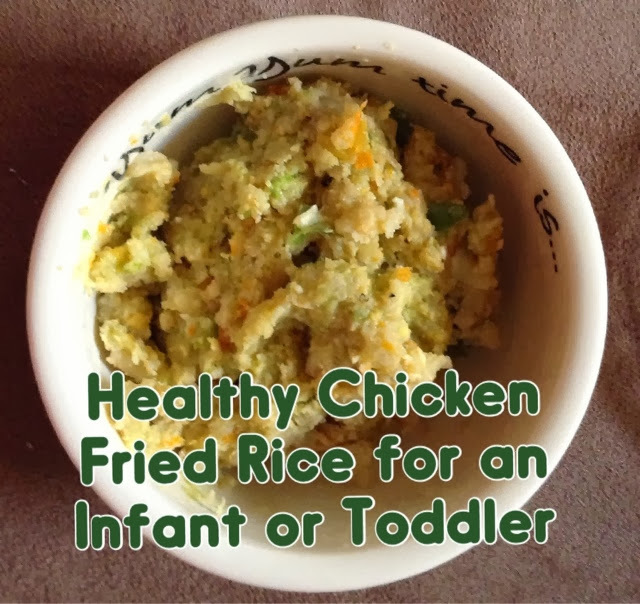 To make it for my toddler I follow the steps until right before adding the soy sauce. I take out about a 1/4 to 1/2 of a cup for my daughter and set it aside. I continue the rest of the recipe for my husband and I. When my daughter was younger and couldn't chew bigger pieces as well I would pulse it in my mini chopper until I saw the consistency of the picture above. Now that my daughter is 17 months old I leave it as it and she really enjoys it. Great recipe. My little guy would love this! I would love to try this chicken Fried rice recipe! Healthier and yummy! I love fried rice! My husband makes it better than I do, so if we have it, he's usually in charge. I also like to use brown rice. I never made my own baby food. I wish now that I had. Thanks so much for linking my recipe! I hope your family likes it as much as we do.